1. Program Beads. These are the vast majority of beads that we use in the program. These beads are commercially manufactured due largely to the sheer numbers involved. These beads are the ones that you may have seen on bead guides that correspond to specific events in treatment. We don’t ask artists to make programme beads. 2. Act of Courage Beads. 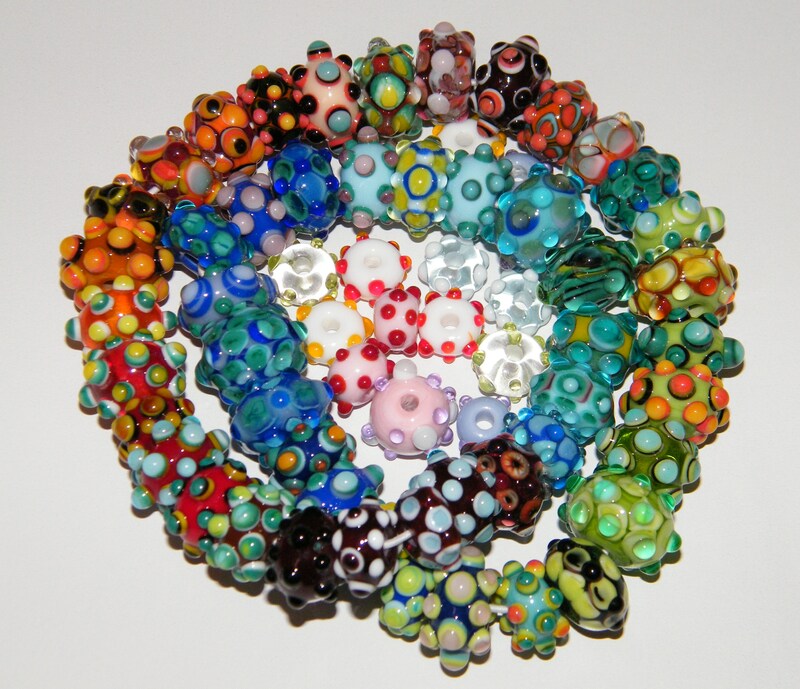 These are the artist-made glass beads that are given to acknowledge the milestones in their treatment journey. This year, we expect that we will need approximately 100,000 of these handmade beads donated so that children can continue to receive one-of-a-kind beads for significant treatment milestones. 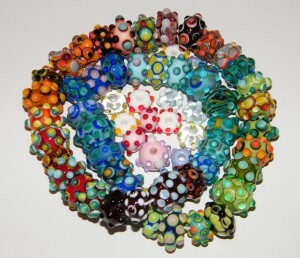 These beads truly bring the arts to our arts-in-medicine mission. Thank you! What is an Act of Courage Bead? Act of Courage beads can take almost any form that you would like to make – it’s an opportunity for you let your imagination go and make new things or whatever you want to do. The 3/32 (approx. 2.5mm) mandrel is preferred but other sizes are also useable.  When you make beads for us please be sure to have nice ‘puckers’ on the ends of the beads. Sharp edges on the bead holes can cut fingers so beads with sharp edges can’t be sent out. Overly frilly bits sticking out might break off and leave sharp edges on the surface so please be sure that raised dots have solid connections (no undercuts) and that surface decorations are robust enough to take some knocking about.  We also ask that you refrain from using reduction frit or glasses that give a metallic sheen on the surface due to heavy metal issues with these materials. We can’t send metallic reduction surface beads out to the kids. 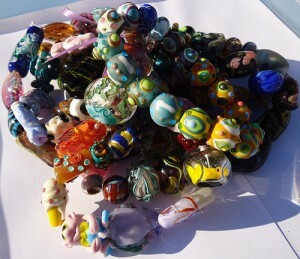  Anneal your beads properly in a kiln to be sure that they don’t crack. Cracked beads have to go into the trash.  Before you ship please make sure that the bead release is cleaned out. Beads with the release still inside take more time for our limited staff to clean and this seriously slows down our turnaround time.  When you send your beads please include a brief inventory in the package along with your contact information. We want to send you a Thank You certificate and a receipt for your donation. If you send beads from multiple donors in one box just include the same information for everyone so that they can all be recognized. Bead donations can be sent to Beads of Courage UK, 7, Kintore Drive, Great Sankey, Warrington, Cheshire. WA5 3NW. Following these requirements will help us get the beads out to the kids quickly and get your acknowledgments and receipts back to you in a timely fashion. All donated beads are inspected and sorted by our staff and making sure that your beads meet the need really helps things move along. Quality is far more important than quantity. None of our member hospitals are set up for direct donation. All beads distributed in our programme are our responsibility so we need to see every Act of Courage bead before it goes out. Please remember to send all of your donated beads to the Beads of Courage UK Headquarters for distribution. You can request that donations go to your nearest member hospital if you like, but remember that there are a lot of kids that need your beads who aren’t near beadmakers and they would love to have your beads too. Please keep in mind, when possible you will be personally invited to special Beads of Courage events at member hospitals where you can deliver Dream Beads in person. We look forward to having more of these events in the future!